Next time you are going to a wedding or an event where you need to wear a cocktail dress make sure you have the perfect pair of shoes to wear by making your own set of glitter high heels. 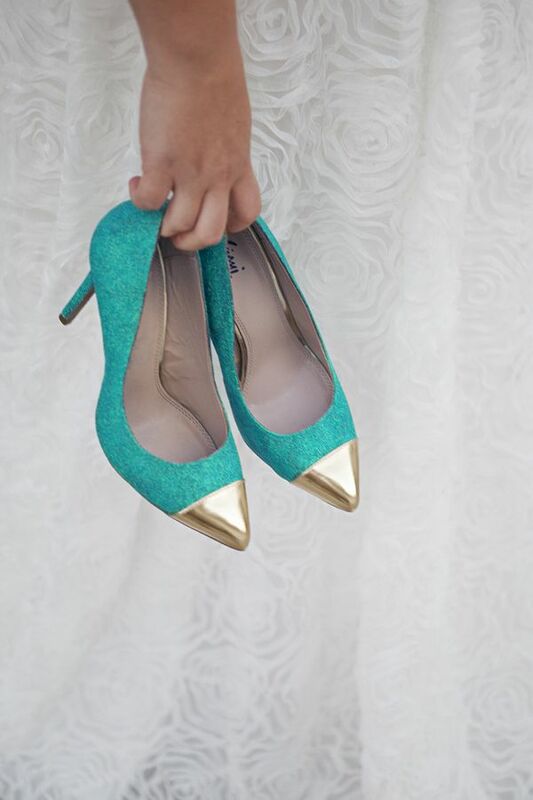 Learn how to paint on glitter to your old scuffed pair of high heels to give them a breathtaking new look at Something Turquoise. Personalize your pencil bag in your office by adding a glitter monogram that looks very chic. Head to Damask Love to find out how to make your own DIY glitter monogram pencil bag. Glitter does a beautiful job at reflecting soft candle light which is why it makes an excellent way to dress up your candleholders. Discover how to make your own DIY glitter candle holders and candles at Bird's Party. Shake it off, either being the negative mood, the excess glitter or whatever it is that has you down. Learn how to make a simple wall hanging to dress up your walls with the DIY banner from Dwell Beautiful. Take one of those standard number candles used for Birthday parties and make it look extra fancy with a coat of mod podge and glitter as done by Delia Creates. Surprise someone on their birthday with a dozen glitter balloons that you can DIY yourself for an easy gift idea. Display fresh cut flowers in your own handmade glitter vase that will make any floral arrangement look extra special. For an easy centerpiece for parties group several glitter vases of varying heights with flowers in the same color. Glitter champagne bottles are all the rage because they make any bottle of champagne seem more luxurious and make a wonderful gift too. Next time you want to give yourself an at home manicure opt for coating your nails with the extra glitter you have from all those crafts with this easy DIY that will leave your nails looking stunning. Do your grocery shopping by making your own cute glitter heart tote bag by decorating a plain bag with glitter. Top unfinished bottles of wine with a glitter wine stoppers, this quick and affordable DIY would make for a perfect party favor for a wine tasting party or wedding. Next time you are going to hang paper lanterns for a wedding or birthday party give them a coating of glitter to turn them into sparkly disco balls that will look amazing at night when they reflect the party lights. Glitter hangers would be an amazing way to hang your wedding dress, or in your child's room for their favorite clothes. Best of all with a quick coat of glitter can make any item hanging on hanger seem extra grand. Next time you are hosting a cocktail party for an Engagement party, New Years Eve or for any other reason, serve champagne in your own DIY glitter flutes. Instead of worrying about guests breaking your expensive glasses pick up a set of cheap champagne flutes from somewhere like Ikea and make them look fancy by decorating each glass with glitter in your party's color theme. A glitter lamp would make a great addition to your child or teenagers room, and best of all it is very simple to make. To make your own glitter lamp, you will need a lamp with a glass base that looks similar to a vase, some floor wax and a container of glitter. To get started on making your own DIY glitter lamp read Artsy Fartsy Mama wonderful tutorial on how to get a perfectly evenly coated glitter lamp without getting glitter everywhere. Remember those plastic magnet letters you used to play with as a child? Well here is a way to give them a new look by coating each letter in a different color of glitter. Once the newly glitter magnets are done, your household can have fun leaving messages to each other on your refrigerator in glitter!